Late in September I met Sergey Bondarenko, director of the Russian Pavilion at EXPO 2015, to talk with him about the long lasting history of Russian participation in the world’s fair, the country’s measures on food security, the special architecture of its pavilion and its broad cuisine. S.Bondarenko: Thank you for the question. And thank you for coming to our pavilion, a beautiful pavilion. 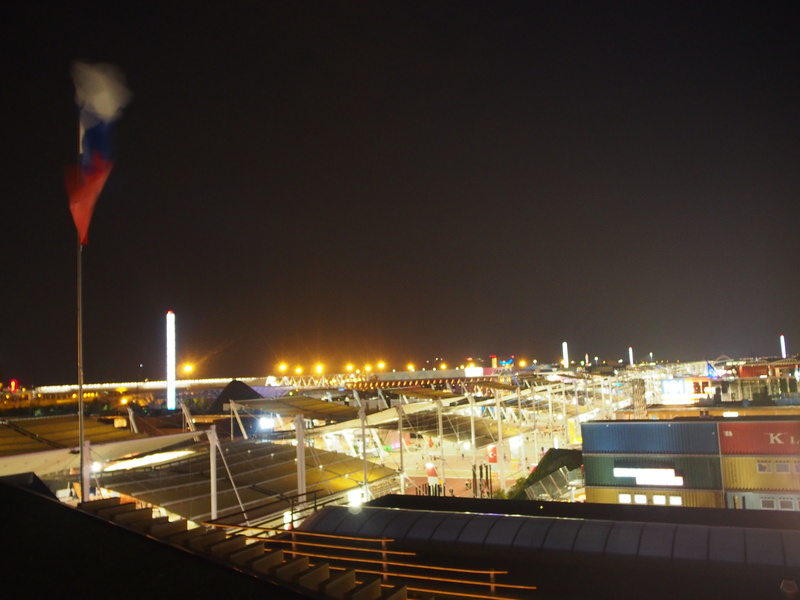 For Russia it is historically very important to participate in the EXPO. We started back in 1851, so we’ve participated since the very first EXPO ever. For us it is very important to have the opportunity to show our country to visitors, to show the richness of our culture and with regards to the topic of this very EXPO 2015 about food and food security our task is to show the variety of our cuisine and culture. So certainly this is a very big part of the culture and we are trying to show that we have a very rich history. We have a very rich cuisine and we are trying to show that Russia has an enormous quantity of different dishes. We are trying to provide our visitors with samples every day in our show-kitchen and water bar, where they can try all these different parts of our cuisine from different parts of the Russian Federation. Preparing for this EXPO, we have thoroughly investigated the history of our different people’s cuisine, from different parts of the Russian Federation and we have collected about 1500 recipes. P.Honisch: Because you’ve got also many ethnic groups in Russia, I guess. P.Honisch: Do you have a number exactly, how many those are? S.Bondarenko: We have more than 180 different ethnic groups, different peoples, who inhabit the Russian Federation and each of these ethnic groups has its own cuisine. We have our famous cook book and we have thoroughly selected 100 recipes for this book, as we think that these 100 recipes highlight the richness of our culture in the best possible way. P.Honisch: But it’s not only about culinary, it’s also about Agrarian sector actually, because right at the beginning, you’ve got an exhibition about the soil, the “Terra di Russia”, to say so, and Russia is also the largest country on earth. Could you talk a little bit about that? S.Bondarenko: Yes, certainly. We are a country with an enormous range of different kinds of soil and certainly we are one of only a few countries, which can provide food security to the whole of mankind, as we have enormous resources for this. Starting from the soil, water resources, fresh water resources certainly, and so forth. Furthermore in the exhibition we have highlighted our most famous scientists, who have – with their investigations, and with their researches – granted enormous possibilities to mankind to provide for its food security in the long term. P.Honisch: Ok, I see. The concept of the pavilion is pretty interesting. You first said actually that it is a beautiful pavilion, according to you, according to me as well. The architecture is pretty special though, as it reminded me of Montreal 1976, do you know anything about this? S.Bondarenko: Yes, certainly. I’ve seen the pictures. This pavilion was created by a very famous architectural bureau, SPEECH, led by Sergei Tchoban. Creating the shape of this pavilion, they certainly were basing on the very rich history of Russia and even the Soviet pavilions at EXPO. You know we have very similar shapes to the Soviet Pavilion at Montreal EXPO, and this cannot be an accident. We wanted to create a dynamic upwards movement.. Creating and constructing the pavilion, we were used the technologically-advanced materials – and we have a very beautiful roof. When you are entering the pavilion the mirror is really very popular and many, many visitors take pictures of their reflections in our mirror. I think that taken the whole experience of the visitors, who come visiting our pavilion, the shape of the pavilion – how our pavilion looks like – creates a very significant part of their experience. P.Honisch: Is there any reason in particular, why you chose this design, which is pretty similar to that from forty years ago? P.Honisch: The history of the Russian Federation isn’t that long lasting actually, it’s barely twenty-five years old. S.Bondarenko: Yes but the history of the Russians exceeds hundreds of hundreds years and you’re asking about some decades – you know. P.Honisch: (laughs) Yes, but it’s also a little similar to the Estonian Pavilion today. Did you notice this similarity, because I thought to myself that those pavilions both got this kind of upward moving architectural structure. S.Bondarenko: Seriously, have you noticed that (laughs)? You know certainly we didn’t coordinate the shapes of our pavilions. I guess our pavilion was constructed a little bit earlier. I will not try to guess, why our pavilions are so similar, being – you know – so close to each other. What it confirms once again though, is that the architectural decision of the design of the pavilion itself was a very good one. Liked and – you know – copied by our colleagues. P.Honisch: What would be your ideas and ideals for the future that you are expressing with this pavilion? How could Russia positively shape the world of tomorrow? P.Honisch: With regards to sustainable food supply for the whole world and energy. I mean you are a large country obviously, with energy resources, with agrarian resources and so on. S.Bondarenko: Certainly we are declaring that we are a part of a whole civilization. Like any big country, we feel our responsibility for feeding the planet and like any big country, we certainly possess large resources to ensure this in real steps. So certainly we are declaring that we are a huge country with a huge amount of resources. P.Honisch: Obviously there is an ongoing debate on the roles of Russia and respectively the West within world political matters of the last few years. I guess you can’t talk much about those things at EXPO, but it also has economical implications as we know, which were enforced three years ago. So why did Russia choose to not engage within those topics at the EXPO? S.Bondarenko: But you know the topic of the EXPO, so clearly there is no necessity to repeat it once again. The topic of the EXPO is “food” and our task isn’t talking about some other things, because we have so many topics, we have so many problems, we have so many difficulties in the world and the food is amongst the most serious ones. So we are talking about a very serious topic at the moment and we are good with this. P.Honisch: What I else found interesting is the rooftop of your EXPO pavilion, what was the thinking process behind that? Because it’s interesting, but also unique in comparison to the rest of EXPO. S.Bondarenko: Certainly our rooftop, “terrazza russa”, is very popular among the visitors that’s because we have shaped the terrace in very good way, I think. We have a very good view from the top of the roof and this is very pleasant while spending very warm Milano evenings on our roof. This is our lounge bar, where we play very peaceful, very pleasant music. We are attracting good DJs for this, in order to have very good music there and I think that all our visitors can enjoy the evening on the “terrazza russa”. P.Honisch: Do you think the EXPO will have a positive effect on Russia and vice versa, referring to the economics of the country and its global status? S.Bondarenko: This is EXPO. And the EXPO is a possibility for any country to expose itself to all the world, certainly for us this was the aim as well and I’m sure that this aim is being resolved in a very good way. Clearly we have many, many visitors and the quantity of the visitors, who are coming to our pavilion, is important for us, because this is an indicator of the level of interest of the world towards our country. We have beaten records, especially in August and September, usually every day. Sometimes the amount of visitors exceeds 50000 people per day and you can imagine, how big of an amount of people that is. This is a very big stadium – you know – every day and over the last month and a half we have had an average of about 40,000 people per day. Certainly this is a great opportunity to show our culture, to show our cuisine, to show the richness and the variety of this culture and cuisine to our visitors and to all the world. So I think, that in any way we’ll have a long lasting effect, because all the people who have visited us, will have in their memories, the impression of their visit and a small piece of the Russian Federation in their memory of EXPO 2015. P.Honisch: Thank you for the interview. S.Bondarenko: Thank you for coming.